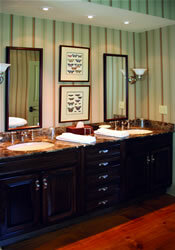 Vermont Woodland Cabinets offers many styles and designs for your bath. The lavatory is a very personal room in the home, and our cabinet shop can offer beauty as well as function. You can enjoy your own design according to your preferences and needs. We offer eco-friendly products and green solutions which focus on sustainability and efficient technologies.